July 27, 2012  Jim Walton, head of CNN Worldwide, has announced he will step down at the end of the year. July 24, 2012  Two former News Corp. editors, Andy Coulson and Rebekah Brooks, have been charged with crimes involving a phone hacking scandal. Coulson is also a former aide to the Prime Minister. There had previously been charges with interfering with the police investigation, but the new charges are directly involved with interfering with the phone messages at the heart of the scandal. July 20, 2012  The newly anointed cable host is a full-time political science professor at Tulane University. Melissa Harris-Perry says she refuses to check the weekly ratings of her show, but she knows she's being watched by more people than she could reach in a lecture hall. 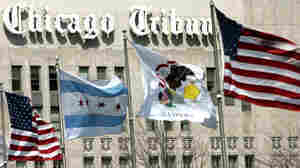 July 6, 2012  Major newspapers in Chicago, Houston and San Francisco are among those that have acknowledged they published dozens of items in print or online that appeared under fake bylines. The items in question were not written by reporters at the papers but by employees of a news outsourcing firm called Journatic. June 28, 2012  A number of media outlets reported Thursday morning that the Supreme Court overturned the individual mandate in the health care law, even as the Supreme Court was announcing that the law was upheld. 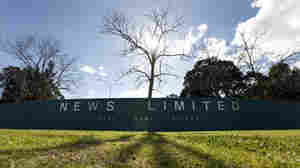 June 27, 2012  News Corp. executives have confirmed they are considering dividing the company in two. One new company would hold all of News Corp.'s profitable entertainment and television outlets. The other would hold all of its newspaper and publishing outlets. The move is seen as a way for the Murdoch family to hang on to its less profitable and troubled newspapers while pleasing investors with a newly independent and far more profitable entertainment company. May 1, 2012  The Murdochs find themselves bloodied at a time they are seeking to restore calm and show they still can assert control over the international corporation. And Tuesday's report concluding that News Corp. misled Parliament about the scale of phone hacking is not the final word. The likelihood of consequences in the U.S. hangs on the horizon. April 23, 2012  This is a big week for Rupert and James Murdoch. The father and son face more questions from a wide-ranging judicial investigation into press abuses at British units of News Corporation: tabloid phone hacking, computer hacking and a police bribery scandal. Monday marked yet another embarrassing day for News Corp and the Murdochs as Sky News acknowledged it had hacked into the email of the target of two stories, despite explicitly telling the inquiry in September it had not been involved in any hacking. April 20, 2012  Rupert Murdoch's British newspaper division is accused of phone hacking and bribing police officers. That scandal has already cost the company hundreds of millions of dollars. Now News Corp. is fending off media reports that a specialized unit engaged in industrial espionage on behalf of the company's global satellite and cable TV operations. Lawyer Follows News Corp. Hacking To U.S.
April 12, 2012  British attorney Mark Lewis was the driving force in lawsuits that cracked open the News Corp. phone hacking scandal in the U.K. Now he's in the U.S. pursuing similar cases against the company here. 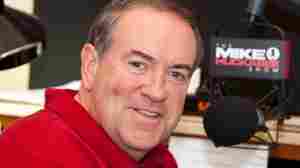 April 12, 2012  Former GOP presidential candidate Mike Huckabee has a new radio talk show, and he tells NPR "it's going to be more conversation and less confrontation." That would be a marked departure from the other man who broadcasts in the noon to 3 p.m. slot -– Rush Limbaugh. 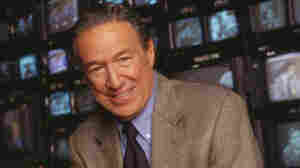 April 8, 2012  No question was too pointed during Mike Wallace's storied and notorious television career. The ambush interview. The gotcha. That trademark inflection conveying disbelief. Was there ever a more entertaining American television interviewer than Wallace? He died Saturday at 93. April 6, 2012  Rupert Murdoch's News Corp. sells an overwhelming majority of all newspapers read in his native Australia and holds a controlling interest in the leading cable news channel. With such dominance, the Murdoch press there draws careful scrutiny of how it covers sensitive issues. 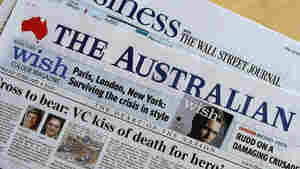 April 6, 2012  Rupert Murdoch's companies sell a clear majority of all newspapers in his native Australia. Among them is The Australian, the country's only national general-interest newspaper, which commands an unrivaled influence despite a modest circulation.